Located just one hour from the international airport, La Paz Waterfall Gardens tour offers visitors the opportunity to get close to nature without having to get up too early. We have designed our tour to make your visit to Waterfall Gardens as relaxing and peaceful as possible. Our departure time allows you to sleep and enjoy, what we believe should be the true essence of Costa Rica. 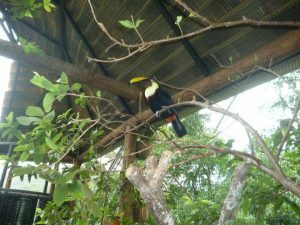 With the Aviary, the Butterflies, Monkeys, Hummingbirds, Snakes, Felines, Frogs, the Casita de La Paz and the amazing waterfalls, you will discover the Costa Rica with which you dreamed. Pickuptime: Between 10:00 a.m. and 11:00 a.m.
Drop off time: Between 5:00 p.m. and 6:00 p.m.
Rates valid from Diciembre 16, 2017 to Diciembre 15, 2018. Manager: gcarvajal@onthegoldentreeway.com *Tours! (506) 83464885 Heredia, Costa Rica.